Riflemen of the 29th Marine Regiment ride a M4A3 Sherman 105mm of Company A, 6th Tank Battalion during the 6th Marine Division's drive on Chuda along the west coast of Okinawa. After expecting a contested landing on April 1, 1945, and seeing little of the Japanese, the Americans were in high spirits as objectives are taken ahead of schedule in Northern Okinawa; the Shuri Line would rob them of their high morale. 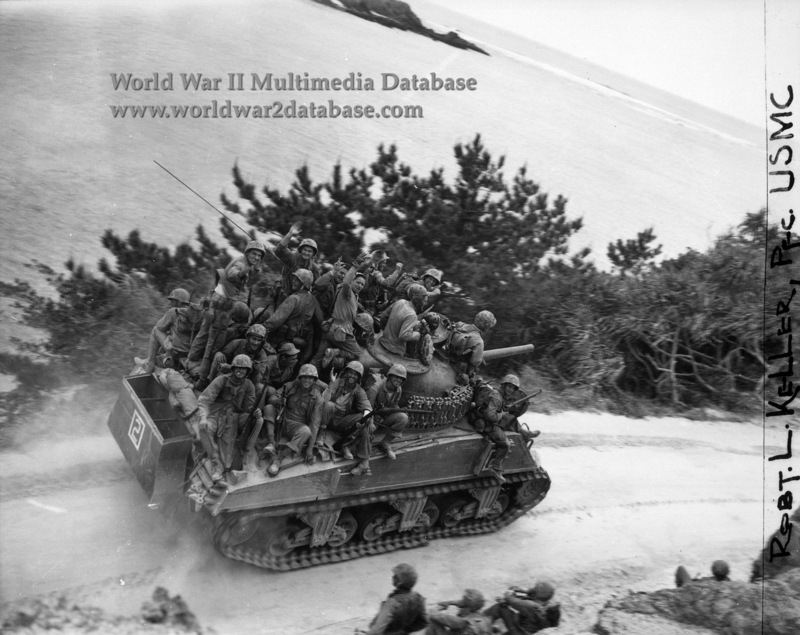 The 29th Marines cut off the Motobu Peninsula and seized Chuda at 1200 Hours on April 6, 1945. Tank-infantry teams encountered sporadic resistance during the initial invasion; most problems were from the Japanese blowing bridges as they retreated inland. Destruction of bridges had been inept; frequently only a span of the bridge had been blown or cracked. The engineers cut quick bypasses for the vehicles, repairing the broken spans later. 500 M4A3 Shermans with the M4 105mm gun were built in late 1944. Later versions of the 105mm Sherman had a more advanced horizontal volute spring suspension (HVSS) with wider tracks that allowed for a smoother ride. Note partially dismantled deep wading gear to allow the M4A3 to move through deep water during the landings a few days before. The M4A3 Sherman with the M4 105mm howitzer was not popular with the tankers, who preferred the M1 76mm high-velocity gun in case of tank-against-tank engagements. However, the 105mm-equipped Shermans were very popular with ground troops, who used tanks as mobile pillboxes, taking out Japanese positions with point-blank high explosive fire.